The upcoming Bollywood movie "The Tashkent Files" is all set to release today on 12th of April (Friday). The Hindi language thriller film is a direction of Vivek Agnihotri and is also written by him. The film is about the former Indian prime minister Lal Bahadur Shastri. The star cast is having Naseeruddin Shah, Mithun Chakraborty, Vinay Pathak, and Pankaj Tripathi in leading roles. As we know that there are some films running now a days like Romeo Akbar Walter, which is again struggling at box office and is not doing good at box office, because of the Kesari Present in the Cinemas, but RAW is getting a stable collections which some how guarantees that it will grab some numbers but will take a time. 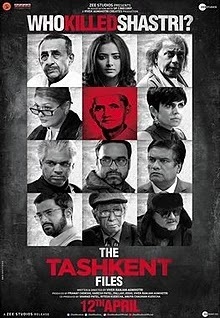 Now if we talk about the "The Tashkent Files", then it seems that the movie will grab the audiences because of the weekend, So one can easily say that "The Tashkent Files" will grab about 03-05 Crore on its first day and will have a total of around 09-11 Crore. The numbers can go down also because of the next release that is a multi Starer KALANK.